With Love Is A Battlefield by Pat Benatar blasting through our speakers we are opening the latest release by the Glenglassaugh whisky distillery. Glenglassaugh distillery has only been reopened since 2008. Before that it was mothballed from 1986 on. The distillery has been mothballed and reopened a few times earlier. The original distillery was founded in 1875. It is located is the most north eastern part of Speyside in Banffshire. Benriach Distillery Co (also owner of Glendronach) is currently the owner of this revived distillery, which is a good thing, since these people know their trade. A very nice book about Glenglassaugh's history, written by Ian Buxton, was published in 2010. Three official larger expressions have been released with the new production, the Torfa is the third. It is the first peated edition, bottled at 50%, natural colour and nonchill filtered. The Torfa comes in an attractive packaging. A bit dark and moody, as they say on the backlabel. It's a young whisky as you might expect, bearing in mind the year of re-opening. We guess 4 years old. One element stood out in our tasting session: the vegetable notes, both in the nose as well as in the taste. 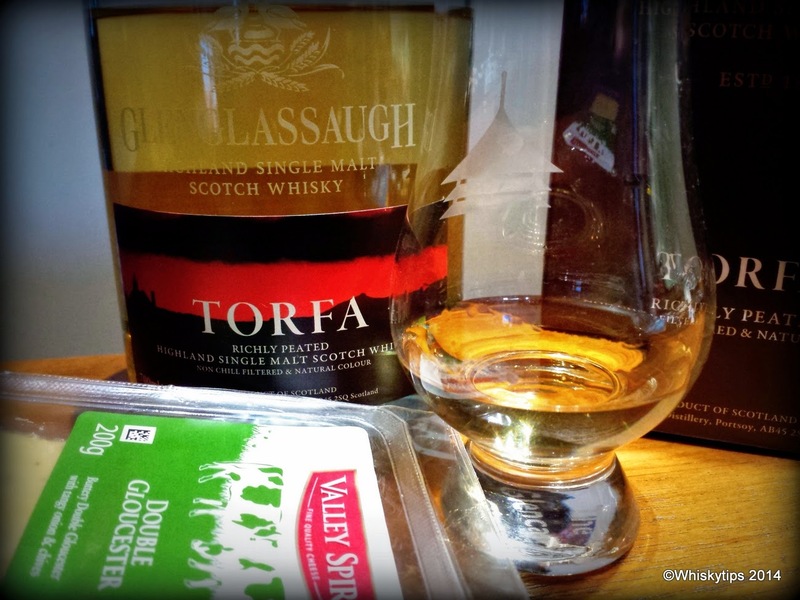 So we grabbed a piece of Double Gloucester with onions and chives to pair this dram. A very nice match indeed, especially with a little jam for the cheese. Conclusion: All in all another nice young whisky from Glenglassaugh. It's powerful and vegetable and certainly raises interest for years of maturation to come. Available at you whisky-specialist.